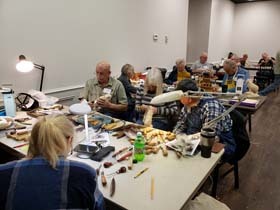 The 9th Annual Ozarks Woodcarving Seminar was another great success, even better than the eighth, thanks again to all the instructors and vendors and all the great people that supported the event. 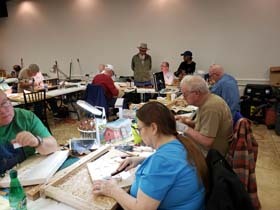 The 10th Annual seminar will be held March 15th thru March 20th, 2020 at the Diamond Room, Knights of Columbus Hall located at 2340 West Grand, about 2 blocks west of Kansas Expressway, in Springfield, Missouri. Click on the map link above. We will have a talented lineup of instructors teaching a large variety of classes over the 5 days. The hours of the seminar are from 8:30 to 4:30. We will have a Kick-Off Dinner on Sunday, March 15th at 6pm. On Thursday, March 19th we will have cocktails & hors d’oeuvres get together from 4:30pm to 6:00pm. 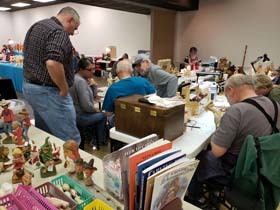 To see and read about the instructors and their projects, come back in the summer of 2019 for the details. Randy Moore of Moore Wood & Roughouts (1-800-825-2657) will be there again to handle your wood needs. Dallas Deege will be there to cover your sharpening needs. 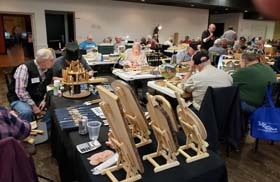 For additional information call John Engler at 417-209-6842 (e-mail: john@johnenglerwoodcarving.com).